The past five years have seen close to half of Metro Vancouver’s new industrial construction occur in Delta and Surrey, thanks to the South Fraser Perimeter Road opening and the availability of acreages suitable for warehouses. According to Metro Vancouver, Delta and Tsawwassen First Nation are home to14% of the region’s industrial land, up from about 11% a decade ago. That translates to an additional 700 acres of industrial development, which has gobbled up green space and left less land for both agriculture and the birds travelling the Pacific flyway each year. While many people feared that further development on the Fraser River delta would rob the birds of a key stopover point, they continue to stop – but they’re doing so in farmers’ fields on a scale unseen in previous years. Approximately 4.5 million square feet of industrial space has been built in Delta since the South Fraser Perimeter Road opened at the end of 2013. 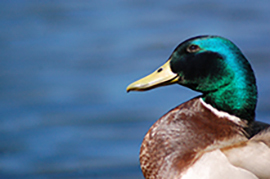 Meanwhile, over-wintering and migratory waterfowl populations increased between 2008 and 2012, the latest period for which comprehensive estimates exist. DeBoer raises forage on 190 acres adjacent to Boundary Bay Industrial Park, a multiphase project with a total of 870,000 square feet of state-of-the-art warehouse space. While his cranberry bogs are dry, the laser-leveled fields seeded to forage are sodden with spring rains. The water pools on the surface, unable to sink into the earth because the webbed feet of several thousand foraging wigeon have sealed the surface like so many bricklayer’s trowels. Meanwhile, the birds have devoured the grass the water would usually nourish. “There isn’t a field that isn’t hammered this way for us,” DeBoer says, pointing to tufts of tall fescue on a close-cropped plain. It’s not just DeBoer and other dairy farmers that are seeing losses. Lydia Ryall of Cropthorne Farm woke up one morning to find that waterfowl have consumed $4,000 worth of radicchio like the proverbial thief in the night, robbing her of greens for farmers markets, retailers and local restaurants. They also devoured $8,000 worth of kale – in fact, pretty much all her greens except leeks. Some of the waterfowl have become even more aggressive, invading the barns of producers such as Stan Van Keulen of Donia Farms Ltd. in Surrey. The birds help themselves to his dairy herd’s rations, and defecate in the rest. The feed bunkers are open and maintaining adequate netting around the open sides and doors of his barns – essential for passive ventilation – simply isn’t practical. This is exactly why they’ve concentrated on the area’s remaining farm properties, which are tightly managed to ensure peak performance in the Lower Mainland’s competitive business environment. “We’re not able to keep up with the impact,” DeBoer says.d with farmers to develop set-asides that provide birds with alternative forage. However, as natural foraging options diminish, demand for alternatives increases – both the set-asides as well as the forage farmers plant for their cattle. The set-asides are funded by the trust in partnership with farmers, but demands on the program mean support from other landholders is needed. “We’re trying to put more birds on less acres and we’re at the breaking point,” DeBoer says. “There’s no value that comes back to the farmer.”The set-aside scheme is one, but there are also direct costs.